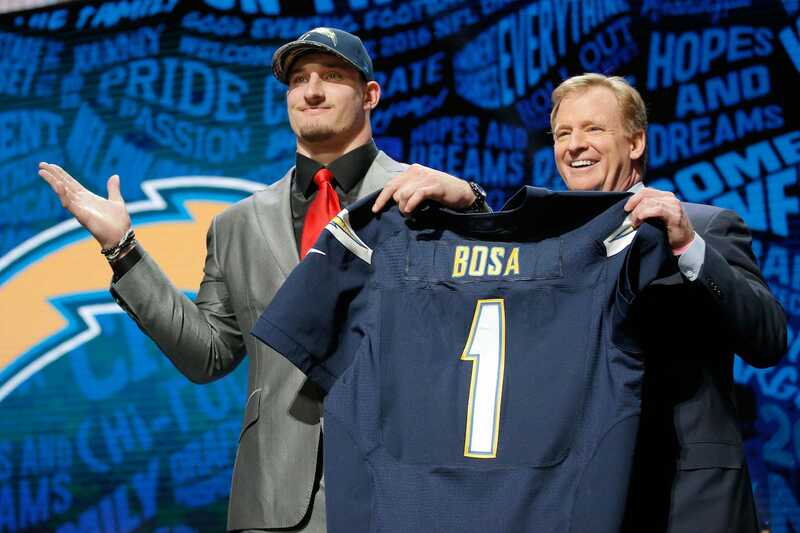 Third overall pick Joey Bosa has still not signed his rookie contract with the San Diego Chargers, and now he is holding out of the team’s 3-day rookie minicamp — all because of a small contract deal that’s extremely unlikely to ever affect him. According to the AP, Bosa is battling his team because he wants no “offset language” in his contract. In other words, he wants to make sure that even in the off-chance he is released from the team before his four-year rookie deal is up, he will still be paid in full. In this scenario, no offset language would also allow him to simultaneously earn money from the Chargers and from the team that subsequently signed him after he were released. Many have called Bosa’s actions selfish, but signing a rookie deal with no offset language is certainly not unprecedented. Late-round picks are especially inclined to want no offset language, as the likelihood they get released before the end of their first contract is much higher. But we’ve seen first-round picks dwell on this, too. Dante Fowler Jr. successfully signed his rookie deal last season with no offset language, and Marcus Mariota briefly held out for the same reason, though he ultimately caved. Plus, under the current collective bargaining agreement rookies have almost no leverage in contract negotiations as the money is mostly predetermined by when the player is drafted. The NFL is a business, and Bosa wants to guarantee himself as much money as he can. Holding out is his only bargaining chip. “Without a doubt we’re all disappointed he’s not here. But our No. 1 focus is the players who are here. Time will work that out,” San Diego head coach Mike McCoy said, according to the AP. Chargers G.M. Tom Telesco echoed McCoy’s disappointment. Hearing this will only bolster Bosa’s argument for a holdout. He’s too valuable for the team to not give him want he wants. But at the same time, teams don’t want to set a precedent for other players who could be impacted by the offset language. But in the end, this is a gripe over a hypothetical that’s extremely unlikely to play out. A player of Bosa’s calibre rarely gets released before his first contract is up. Assuming Bosa isn’t a complete bust — and early reports have been nothing but positive — this will all be much ado about nothing. Chargers mandatory training camp begins July 30. As that date inches closer and a real holdout becomes a real possibility, the Chargers should blink and give him what he wants.